This article is a short summary of Super Paper Mario. Super Paper Mario is a hybrid platformer/role-playing game published by Nintendo for the Wii console, and the third installment in the Paper Mario series. Developed by Intelligent Systems, the game was first released to North American and Japanese audiences in April 2007, and to European and Australian audiences in September 2007. The title was originally announced and in development for the Nintendo GameCube, and was later considered for release on both the Nintendo GameCube and Wii before being completely shifted to the Wii. Flip into 3D and keep going! It's an adventure that's out of this dimension! In the beginning of the game, Princess Peach and Bowser are taken by a villain named Count Bleck, who forces them to be married. This causes the appearance of the Chaos Heart, which opens the Void, a dark hole that threatens to destroy all worlds, as told by the Dark Prognosticus. Mario afterward meets Tippi, a Pixl, who takes him to meet Merlon, who tells Mario that he must collect the eight Pure Hearts in order to counter the Void, as told by the Light Prognosticus. Mario therefore goes on a quest to obtain the Pure Hearts, defeat Count Bleck and destroy the Chaos Heart before all worlds can be destroyed. 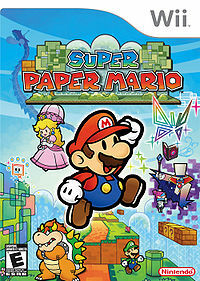 Super Paper Mario marks a departure from the turn-based gameplay of the previous games, instead mostly being a platforming game with elements of a role-playing game. Mario and enemies retain HP stats, and enemies can be defeated by attacking them. Mario's party consists of four playable characters, each with their own unique abilities and attributes. Mario himself gains the brand new flip ability, which allows the player to view the environment from a 3D perspective and is used to solve puzzles or avoid otherwise unavoidable enemies or obstacles, though the ability runs on a timer. Instead of the more traditional partners, the player instead gains Pixls, fairy-like creatures who give the player additional abilities. EU: 2012 A re-release of the game as part of the Nintendo Selects lineup. Super Paper Mario Wii U NA: 2016 A direct port of the original game as a digital download on the Nintendo eShop for Wii U. This page was last edited on 3 November 2018, at 22:36.